Good morning my dears! I thought I'd greet you mid-week with the introduction of another new series on the blog: Fav Freebie. I'm always coming across fabulous downloads that creatives in the blogopshere generously share with their readers, so each week I'm going to highlight a favorite and link to the source so you can get your own, if you so desire. This week was an easy decision. 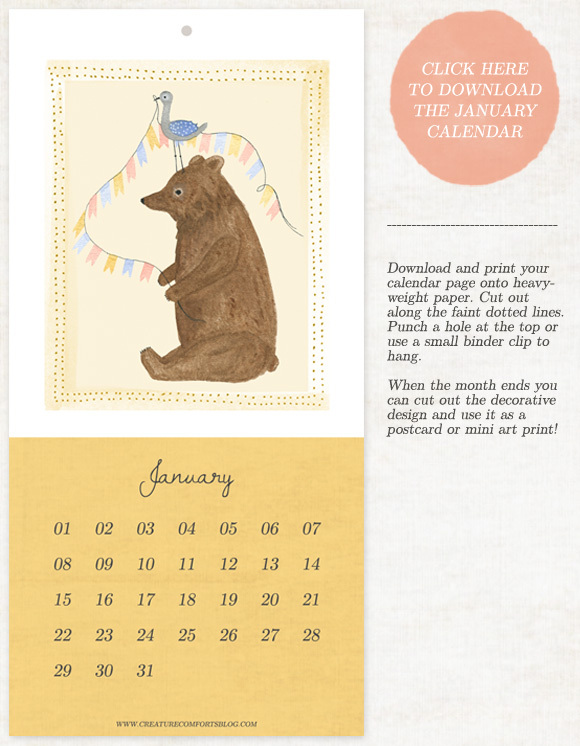 Pictured above is a January calendar created by Ez over at Creature Comforts. She is one of my top favorite bloggers and is always coming up with inspiring DIYs and printables, so be sure and add this blog to your Google Reader (or whatever you use to peruse). Click on the link in the above paragraph, and it'll bring you over to Ez's site, where you can download a copy. She made it so that when the month is up, you can trim off the bottom part and keep that cuddly bear for some wall art.